I thought about this for many days. It had to be just the right word for me and my blog. I wanted it to pertain to my personal life as well as What Meegan Makes. 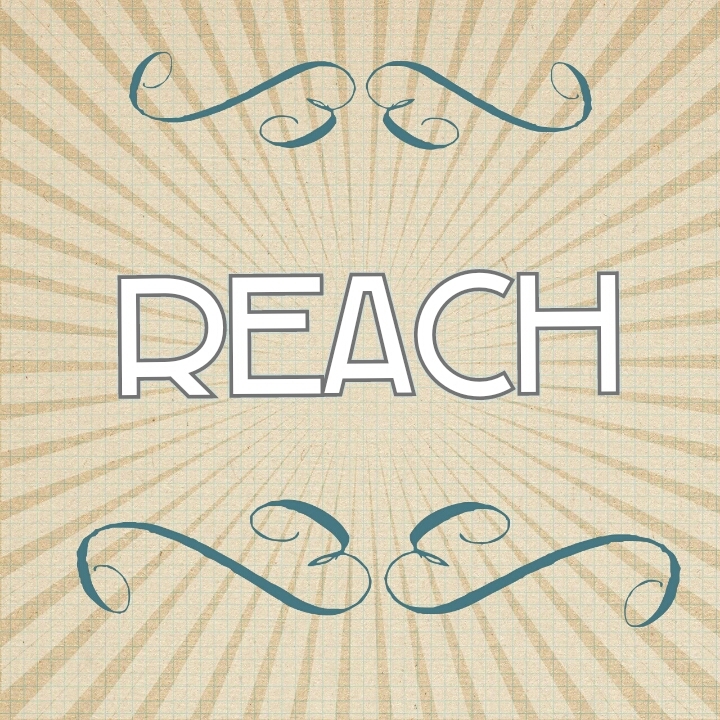 When I think of the word “REACH”, I think of many things that connect me to my blog and to my personal life. ~out of my blogging comfort zone. I don’t share much of my personal life here on What Meegan Makes. That is going to change. I feel like I want YOU to get to know ME and not just what I do. ~out to my readers and followers. I have’t been very faithful at responding to comments. That is going to change. It is one of my biggest weaknesses as a blogger. And, I need to REACH to change that fault. ~out to looking into how my blog can be a better, more informative place for you to visit. That will be changing VERY soon! ~out and try new projects. I have SO MANY projects in my head, but I am afraid of failing. So, I need to conquer this fear and REACH forward. ~out to other bloggers for help and ideas. I can learn so much from other’s experiences and wisdom. I need to do that for myself and for YOU. ~out and attend a blogging conference. I honestly haven’t gone because I am too scared. Isn’t that silly?? I don’t know what I am scared of…But that is something else that will happen in 2014. ~out and make video tutorials for you. So, you can better see what I am writing about. Won’t that be fun?? I am super excited about this REACH goal! ~out to serve others in my own community. I have many opportunities, but I don’t often take full advantage of them. It’s time I do so. ~out to work out more. I need to care for myself, so I can better take care of Hubby and my family. And, in turn that will help me take care of my blog, too. There are so many more ways the word REACH coincides with my personal life. When I think of the word REACH, I actually picture a hand reaching out to help someone or something. That is what I want to do this year REACH out in every aspect of my life. I am excited to visualize this word in my life and take action. Because after all, REACH is a verb, an action word. What word would you want to apply in 2014? What word would best describe what you want to accomplish? I hope we can help each other through this upcoming marvelous year with anticipation ans REACHING out. Make it a wonderful NEW YEAR!! Those are some large goals and I look forward to seeing all the changes that come about on your blog. Happy New Year! Thanks for stopping by Allison. I am so happy to happy you here. Happy New Year. I think REACH is a wonderful word! Thank you for putting into words all the areas you want to reach in your life. I agree and have many similar thoughts, but haven’t put them into a list like you have. Maybe putting them into a list is too much of a commitment :). As I look back on 2013, I realize how much I have grown, and been blessed, by all the challenges/opportunities that have come along. So, maybe this year I can REACH and make the challenges opportunities, which in the end become blessings. I chose the word perseverance…to keep going no matter what comes my way. Happy New Year!! What a great word for you Crystal. What a joy it has been to be connected with you! I am honored and excited to meet you some time soon. Hmmm…I need to look into conferences soon. They all fill up SO fast!! I love this word, and I love all your goals. I love how you visualize it. That so touched my heart. Happy 2014 friend! Aw, thanks so much for your sweet words Joanne. I love the word faith. That was my word for 2012 :) I hope to meet you at a blogging conference sometime soon!! Make it a great 2014. Great word! I’m still working on mine. I like your personal goals too!